Sail the shimmering sea of Mallorca on a full-day boat trip around picturesque Palma Bay. Plunge into the crystal clear waters for a revitalizing dip during a selection of swimming stops and admire spectacular coastal scenery as you cruise past places like Portals Vells, Punta de s’Estaca and Magaluf. Feast upon a delicious lunch of traditional paella and sip sparkling cava as you listen to melodious Spanish music. Tour commences from the Palma de Mallorca port and selected Mallorca hotels in the southern area. Depart from your Mallorca hotel in a comfortable, air-conditioned minivan (or make your own way to the port depending on which option you selected). Arrive at the picturesque port of Palma then climb aboard your stylish catamaran to embark upon your aquatic adventure. 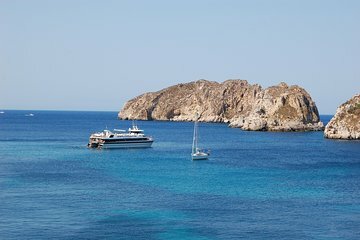 Admire the seaside splendor of the shore as you sail towards the Malgrat Islands; pass natural landmarks such as Cala Mayor, Portal Nous and Magaluf and stop intermittently to plunge into the inviting waters of the ocean. Soak up the soothing sunshine on comfortable benches while listening to traditional Spanish music. Pleasure your palate with a selection of Spanish specialties such as flavorsome paella (a rich rice dish with fresh seafood or succulent chorizo) and ensaimada (a sweet pastry desert). Sip decadent cava or sweet sangria as you travel back to the port. Please see the itinerary section below for pickup locations within the southern area of Mallorca. Please be aware that pick up is only available from selected hotels south of Palma. If staying in Central Palma, the tour will depart from Palma Bay port.